Is Pine Island Glacier the Weak Underbelly of the West Antarctic Ice Sheet? It is popularly understood that glaciologists consider West Antarctica the biggest source of uncertainty in sea level projections. The base of the 3000-m thick West Antarctic Ice Sheet (WAIS) – unlike the much larger East Antarctic Ice Sheet – lies below sea level, and it has been recognized for a long time that this means it has the potential to change very rapidly. 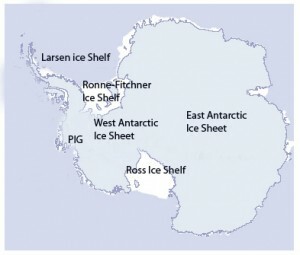 Most of the grounded West Antarctic ice sheet drains into the floating Ross and Ronne-Filchner ice shelves, but a significant fraction also drains into the much smaller Pine Island Glacier. Glaciologists are paying very close attention to Pine Island Glacier (“PIG” on map, right) and nearby Thwaites Glacier. In the following guest post, Mauri Pelto explains why.